In some specific situations, Mac users running OS X Yosemite may wish to re-download the complete installer application of a prior operating system like OS X Mavericks. This is typically something only advanced users would want to do, perhaps for making a bootable installer for the older OS X version, for upgrading a different Mac, or even to downgrade (more on that in a moment), but unless you have a compelling reason to download the prior OS X release installer there is little other reason to do this. To be perfectly clear, simply downloading and attempting to run the old installer alone is not sufficient to downgrade from OS X Yosemite back to OS X Mavericks on a Mac. Users who wish to accomplish that could either use an old Time Machine backup, use internet recovery, perform a clean Mavericks install, or follow this to make a bootable installer drive for OS X Mavericks, all of which are much more technical processes that are not going to be covered here. Do not attempt to install OS X Mavericks over an existing OS X Yosemite installation, it will not work and you will almost certainly break something which could result in file loss or worse. To be able to find the Mavericks installer app, you must have downloaded it at some point with the same Apple ID you are using to access the App Store. If you never previously downloaded it or installed it on a Mac, you will not find the installer available on that account. The familiar “Install OS X Mavericks” app will appear in the /Applications/ folder of the Mac when it has finished downloading. At this point you can do whatever your original intention was with the installer app, whether it’s simply copying it to another older Mac to upgrade it to a newer OS (but not to Yosemite), make a bootable installer drive, format and run a clean install of the OS X 10.9, or whatever your plan was. For what it’s worth, this process works to download any other older version of the OS X installer app that is attached to your App Store account, as well as re-downloading the installers of currently active versions of OS X, including the install application for OS X Yosemite. It sounds like you signed up for some cruddy SMS service and you should contact your carrier to cancel that. Fortunately, that has nothing to do with downloading the OS X installer apps! Mr. Biggs – are you daft? After fumbling with the crashprone buggy nightmare release of OS X Yosemite for a couple of weeks, I backed up my files, formatted the drive, and did exactly this to make a drive to re-install clean OS X Mavericks. Running 10.9.5 right now as we speak, have zero intention on touching Yosemite again on this Mac, I have no faith in Apple resolving the problems with it. OS X 10.10.1 did nothing and the OS X 10.10.2 ‘beta’ is only a wi-fi fix? Nope, not good enough, sorry Apple you lost me! OS X Yosemite is the OFFICIAL Apple Windows Vista, or maybe Windows 8? What’s worse? I don’t know, but Yosemite is the worst release of OS X ever made! Buggy, unreliable, unreadable, ugly, slow, slow, slow, slow, slow, buggy, slow, did I mentions low and buggy? It’s just an all around mess. I told a family member to update to Yosemite a while ago… that was a huge mistake because it has been a nightmare for them too! 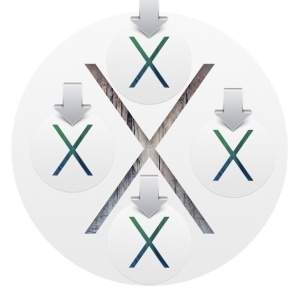 AVOID AVOID AVOID OS X YOSEMITE, do not let Apple get away with this garbage release! OS X Yosemite is half-baked right now and while OS X 10.10.2 could be usable, it won’t be out for a while. At the moment, OS X Mavericks is a more consistent and stable experience for many Mac users, and I long ago stopped recommending anyone updating to Yosemite after experiencing many issues with friends and family members who updated to it and ran into either the many bugs or problems with reading the screen due to blurry fonts on non-retina displays. Also, Yosemite is incompatible with many AFP and SMB network environments, which makes it unusable in the workplace for many employed folk. A clean Yosemite install or a Mac that comes with Yosemite pre-installed seems to run better and have considerably less issues, which suggests something happens in the ‘upgrade’ process that skews many OS X installations, and that could be the cause of many of the Yosemite problems. In the meantime, if someone is on Mavericks, yea, stay put, unless you want to spend a weekend fixing someone elses computer (and that is not my idea of fun!). Not sure about your Yosemite issues. Yosemite works beautifully here on a Late 2013 – 27″ iMac. I have WiFi syncing and everything. No problems here. BS! You have a problem with your Mac. I’ve been running Yosemite since the public beta and it’s rock solid. It’s smoother and faster than Mavericks was, and I’m on six year old hardware. It’s not any buggier than Snow leopard was, and nothing crashes. Yosemite works fine for me on my MBP 13″ early 2011. Did so from the start. Absolutely 0 problems. J. Harbaugh: well said! When I backed down to Mavericks from Yosemite after about two weeks trial, I had lost most of the work done while on Yosemite and a good number of little glitches remained (mangled and buggered email lists mostly as I remember). I was hoping to hear that Yosemite had been fixed. Except for losing WiFi sometimes (hoping that should be fixed with 10.10.2), I have no problems with Yosemite. Works perfectly on my iMac 2012. I did reinstall Maverick too: Yosemite is not running right on my iMac Late 2012 (i7, 16GB, Fusion drive, GTX 680MX 2GB). The video drivers are garbage: games are really lagging and some of them really unplayable. A few important options are suddenly greyed out, the sound balance was f#cked up and could not be corrected and I had a lot of other bugs too. Now, I understand that some users don’t experience any issues with Yosemite, and that’s fine, but since 90% of the Apple users are complaining about this OS, I’ m pretty sure there’re problems with it…. I’m rather tired of the smarmy prats who post ‘it works for me’, well lucky you. of the UI in both OSX 10.10 and the past couple of ios releases, indicates there are some major management problems at Apple. I’ve been using Mac’s since ’84 and OSX since it was beta, and I’m becoming quite disappointed in Apple’s penchant for releasing ‘something new’ just for the sake of it. Truth be told, software wise, they’re on a downward spiral to being just slightly less mediocre than their competitors. I too am a lifelong Apple user. And we must keep in mind that Apple has a devoted and rabid fan base who would declare “it works for me” all the way to and from the Genius Bar and suffering from all the worst of the bugs, who refuse to admit anything that Lord Apple produces could be inferior in quality to what is expected when you pay a huge price premium for a product that ought to reflect that premium in quality of software. OS X 10.10, 10.10.1, 10.10.2 are all dreadfully inept at offering what is expected from the Mac: stability, predictibility, ease of use, accessibility, the list goes on. Yosemite is The Jony Ive With A Retina Display Show, all else be damned. The quality of Apple software has taken a nose dive that continues to plummet into the toilet, starting with Lion on the Mac and iOS 7 on the iPhone iPad. Will it ever turn around? I’m not counting on it, and that sure disappoints me. Would love to be surprised though! I wouldn’t be surprised if they are contracted by Apple to make positive posts all over tech discussion sites for a little cash. I’m a two year Apple user after switching from decades with MSO and there are bugs in Yosemite. I feel Yosemite is a half baked release…..the GUI is crap and inconsistent, the font is too light/thin/blurry/tiny, Air Drop is fickle, Junk mail doesn’t work after upgrade, and Handoff doesn’t work like Apple said it would. The major problem at Apple is well known: Steve Jobs is dead. They don’t have his vision nor his tenacity to produce perfect products and certainly don’t have his sense of legacy. Ah, yes, let’s review some of those “perfect” products that were released under Jobs! And, his “perfect” business decisions! Lisa, Apple III, iPhone 4 and Antennagate, iTunes, Mobile Me, The Cube (intriguing design, commercial failure), original iPhone pricing debacle, hockey puck mouse, the iPod Hi-Fi, recruiting John Sculley (debatable), NEXT, Windows 3 licensing deal with Gates (gave up the Crown Jewels), etc. *NONE* of Apple’s products have ever been “perfect”..
Now, if we’re only considering “tenacity”, we’d have to be a fly on the wall to know what goes on at Apple these days… We do know, though, that many of the products released under Cook are clearly as good as those produced under Jobs. Gotta say, when Mavericks was released I did the usual download and clean install on an old Apple stock 320GB HD. At that time I found it a little buggy so I stuck it into my other MacPro and continued with the most stable Mac ever… Mountain Lion. Again with the release of Yosemite I did the download and again clean installed it – buggy is only half the problem, there are fundamental flaws within the entirety of the OS – Apple seems to be running services that report back to Apple your entire on line existence, I swear the MacPro running 10.10.1 communicates more with Apple than with me. Jon Ive’s HAS NO BUSINESS in the software or hardware ends of Apple (other than designing enclosures). I used to tell people back when ( I’m one of those original fan boys, who’s now Very Very Disgruntled ) that the difference between Mac & PC was …on the Mac you tell the computer what to do, while on the pc …the computer tell you what you’re allowed to do… My how times have changed !!! Well there’s my New Years rant… Here’s hoping Apple spends the next 5 years making as OS X of my dreams. I am running Mountain Lion (10.8.5) and would like to upgrade to Maverick (not Yosemite) but cannot locate the installer (never downloaded it before so it is not in my App Store). I need to upgrade to Maverick in order to run financial software that minimally requires Maverick, otherwise I would stay with Mountain Lion. Can anyone help me with where/how I can install Maverick? I am a novice so the simplest form of install would be great. But maybe a friend can create a USB with the Mavericks installer ? I suppose that would be legal ? I bought the mac already with Maverick so I don’t have the install file in purchases . What can I do ? My daughter installed Yosemite – along with each update – on her 2012 Macbook Pro. It was literally like running her computer off a floppy disk. She hoped each update would be an improvement, but it somehow just got worse each time. She is a university student (University of Utah) and runs only the most fundamental programs. She begged me to revert her back to Mavericks, but I could not figure out how. This site – and these instructions – are a God-send. I have reverted to Mavericks and she is ecstatic. I now have a copy of the Mavericks install file stored on a thumb drive. The Yosemite experience felt like I was working in the 1980s all over again – extremely long wait times, having to constantly fix things, having to update every time she just wanted to do something as simple as print a file. I just don’t get why this is happening to the vaunted Apple products. that apple doesn´t support Mavericks anymore. To ask someone for a Mavericks Image. Could we arrange something ;) ? Question, I tried reverting back to Maverick without the use of the Time machine…. How did you complete your installation of Maverick? I’m losing my mind with Yosemite…(horrible). Can you still get Mavericks anywhere if you haven’t already? I’m on Mountain Lion and Adobe is about to force me to upgrade to Mavericks, but I don’t want to go all the way up to Yosemite if I don’t have to. I hate upgrading – why they always trying to fix what ain’t broke!? Following these instructions for both Mavericks and Mountain Lion, I get as far as the prompt about “do I want to download it anyway” and the App Store just sits there, with the “Download” button grayed out for the purchase in question; the download never occurs. If I quit App Store the button is no longer gray and I can repeat the loop. I can’t seem to actually download the old installers. Any help? In Yosemite, the “Purchases” section only shows me my most recent purchases. Like the last month of purchases. No Mavericks obviously. I agree with the fact the Yosemite is the worst software of Apples history! Unfortunately, I did not backup my computer on a ‘Time Machine’. … I don’t understand…. is there no way to go back to Mavericks…. (I hate Yosemite – it stopped me from using Smart Notebook, as it is my teaching software). #teaching abroad #No Apple stores in this country . If you do not have a backup of OS X with OS X Mavericks, you can not downgrade to from OS X Yosemite to OS X Mavericks without erasing everything and losing all of your stuff. You can copy your user folder to a USB drive, then wipe the internal drive, install Mavericks, and set up a temp user. Then copy your saved user folder into the User folder. Finally, create a new user with the same name as the User folder; you will be asked if you want to use the one that’s already there, say yes, and you’re done. A simple Solution & workaround for a Mavericks OX S install. I too am forced to upgrade after hanging with Lion. I with many others it appears have been faced with in order to be able to continue to get updates ( in my case Adobe updates), I will need to upgrade my OX S. Honestly I have been avoiding upgrading to both Yosemite & Mavericks for a reason…. mainly because of being forced to use “the cloud”. A very good thing to avoid! But after reading the endless horror stories about how awful Yosemite is as an operating system that alone is enough to bring me to a full stop! I will NOT self inflict the problems ofYosemite into my life and my business! So to do a clean instal of Mavericks I would suggest that instead of going to eBay or to a mystery website to buy a thumb drive with Mavericks that also runs the risk of also containing a possible trojan virus or keylogger..
My advice is find a local “Mac Repair Store” and see if you can get/buy a copy of their Mavericks OX S thumb drive. PS: The cloud is not safe ! Don’t believe all of the endless “profit driven” hype that “The Cloud” is your friend and the cloud is safe! The cloud is a huge target and is very hackable = it’s Not Safe! Don’t be a sheep! = Think ! Unplug your devices from the electrical SYSTEm. Ever hear of Broadband thru the electrical system ? Electric companies use to read your meter by sending a guy out, nowdays their device uses the broadband over the electrical system which few know about – mainly ham operators as the radios nowdays are computers and all sorts of weird things happen to the radio – gov’t spying probably. Which is why Apple has stopped all forms of fixing their systems. If a mega computer system is just going to create more problems (we are told hackers, but wonder if the Chinese have Mac problems ?). Hence, look at all the apps for n the app center which are worthless. Steve Job knew this was going to happen, hence is why Cook doesn’t give a oot either. Apple is just throttling computers so as to sell another computer – you cannot win on the Apple OS or MSFT system. As remember the days when they put the system on 5 or 6 floppy disks ? OS 10 could easily fit on 7 or 8 disks… What’s taking up all that extra space is just their program to google up more space on your hard drive as it’s all about fooling the public a bit like car companies still selling cars that only get 25mpg. Just a way to slow everybody down. Like how the battery car will be limited to 200 miles but for $50,000… And wait til people have wifi issues with their cars – GM ignition switch is mechanical, imagine stalling your car on some train tracks – great way to get rid of some people. As who are you going to sue? GM or Apple or the software company or the makers of the chipset? Insurance on wifi enabled cars. Well, wonder if they’ll make all the cars & trucks with wifi onboard so ins companies can raise rates. Remember using a paper clip to reboot the system. Those MacPluses hung up. But, they didn’t take FOREVER to start up a system. So long as people don’t mind buying a new computer or iPads. The company see no reason to fix their system. Hence, if you ever buy another computer NEVER upgrade it. Be it, Apple or a MSFT system. Like somebody said their are people out their who are loyal Apple Users and will never say bad things about Apple. Because, they’ve probably learned never update your system. Like the saying “if it ain’t broke don’t fix it”. Apple has made the perfect system of making people continually buying another computer. Which is why Jobs didn’t want to bring out the pencil. Which do you really need a computer if you have a pencil ? Wait till your wifi car won’t start and it’s snowing out – will Apple offer a discount at some expensive hotel nearby or did you remember to bring your -50 degree sleeping bag & your tent? How do I make it let me have another copy of the installer, now that their certificates have changed? do! I have a nice 2010 MacBook-Pro w/SnowLeopard. Rather than upgrade & maybe ruin it, I bought another w/Yosemite. For your old Mac with Snow Leopard – if it ain’t broke, don’t fix it. If it works for you as is, there is little reason to update it. It’s 6 year old hardware. If you already have a new Mac, just use the new one (avoid Yosemite though, it is awful compared to Mavericks or El Capitan). Mac OS X Snow Leopard is good, it is by far the most efficient and stable Mac OS Apple released in the OS X series. OS X Mavericks is somewhere between “OK” and decent, Mavericks is way better than Mountain Lion or the disaster that was Lion. OS X Yosemite is a nightmare, avoid it. OS X El Capitan is “OK”. Personally, I would keep Snow Leopard on older Macs, Mavericks on moderately aged Macs, and El Capitan on new Macs with tons of RAM / SSD only. These instructions do NOT work for me. In purchased, it says “Downloaded” for the Mavericks installer and is greyed out. So that is not going to help. I always keep copies of Mac OS installers, just for this reason. But, for some reason, every copy I have of the Mavericks installer says that there is something wrong with the file. But I have used that file many times to install Mavericks. So very confused! I have a flash drive that is a Mavericks boot disk and then that stopped working without warning. greyed out in disk utility and wont mount. what a nightmare! don’t recall these kind of issues before Jobs died! It’s likely your older copies of the Mac OS X installer are not working because of the certificate issue that Apple bungled. I have run into this myself. The trick is to set your clock back in time to before the certificate problem occurred, this can mean setting the clock back a year or more sometimes, aim for when the installer was released. Then the installer will work to install OS X on the Mac. Annoying, indeed. Try that out though, it works. To redownload the OSX 10.9 installer, you must do this on the Mac you used to download Mavericks in the first place. The button in the list of the “Purchases” tab in your App Store app will then be live and not dimmed. If you try to redownload on any other Mac, all you get will be a dimmed “downloaded” button.